← Okay, Finally Showing Some Backbone! A Record to Make Texas Proud! The annual State Fair of Texas is known for two things: the giant “Big Tex” figure and the plethora of fried foods. Every year culinary extremists try to outdo one another by finding something to fry. Ice cream, Snickers bars, bubble gum and margaritas have all fallen victim to vats of boiling lard. (I’m not kidding! They’ve actually fried these things!) 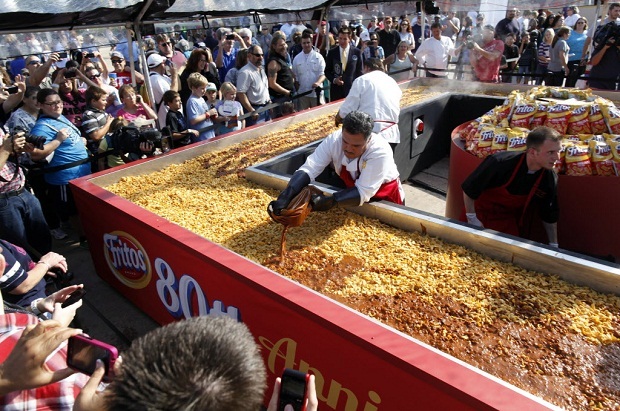 This year, however, some lunatic produced a new acid reflux – laden feast: the world’s largest Frito pie. Last week a crew from Frito-Lay combined 635 bags of chips, 660 cans of chili and 580 bags of shredded cheddar cheese to create the 1,325 pound gastronomical monstrosity. It all came together in what can only be described as a trough. Somehow, in present-day America, that actually seems appropriate. Seems like a tragic waste of food!